Research has demonstrated (summarized by van Es et al., 2007) that soil and crop management practices, combined with weather conditions during the early growing season, greatly affect N losses and are therefore critical factors in determining optimum N rates. The difference in fertilizer N needs from one year to the next could easily be 100 lb N, and generalized N recommendations are inherently imprecise. In a recent case study, we highlighted the impact of early- vs. late planting on recommended N rates (What’s Cropping Up?, Vol. 21, No 4). It is not possible to accurately determine at the beginning of the growing season how much N fertilizer will be needed for that year’s crop, because some critical processes that affect N losses have not yet passed. Most growers fertilize for a worst-case scenario and apply “insurance fertilizer” – they put on in excess of what is needed in most years. This reduces farm profits and causes high environmental losses. Seasonal corn N needs can be estimated much better in the late spring to guide sidedress applications. 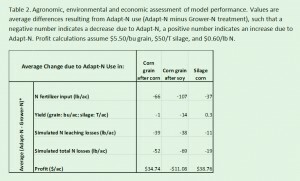 Adapt-N is an online decision support tool (http://adapt-n.cals.cornell.edu) designed to help farmers precisely manage nitrogen (N) inputs for grain, silage, and sweet corn. It uses a well-calibrated computer model, and combines user information on soil and crop management with high resolution weather information, to provide N sidedress recommendations and other simulation results on nitrogen gains and losses. We have completed the first year of beta-testing through on-farm strip trials in New York, which are presented in this article. We completed 18 replicated strip trials on commercial and research farms throughout New York during the 2011 growing season. They involved grain and silage corn, with and without manure application, and different rotations (corn after corn, corn after soybean, and corn after a clover cover crop; Table 1). Treatments involved two rates of nitrogen, a conventional “Gower-N” rate based on current grower practice and an “Adapt-N” recommended rate. A simulation was run for each field prior to sidedressing to determine the Adapt-N rate. In 2011, due to seasonal weather conditions, all Adapt-N rates were lower than conventional N rates (by 15 to 140 lbs/ac; Table 1). Growers then implemented field-scale strips with 3 or 4 replications for each treatment (except NY8 and NY9, where only single yield strips were implemented due to time and equipment constraints). Yields were used as measured, regardless of statistical significance, since the statistical power to detect treatment effects is inherently low for two-treatment strip trials. For corn, a grain price of $5.50/bu was assumed ($6.50/bu minus $1.00/bu for drying, storing and trucking from PA Custom Rates; USDA, 2011). For silage, $50/T was assumed based on reported NY silage prices of $25-75/T. The price of N fertilizer was assumed at $0.60/lb N (prices ranged from $0.49 – $0.75/lb N in NY). Total N losses to the environment (atmosphere and water) and N leaching losses were estimated for each treatment by running model simulations with all N inputs through the end of the growing season (30 October). Agronomic, economic and environmental outcomes of these trials were then used to assess Adapt-N performance. 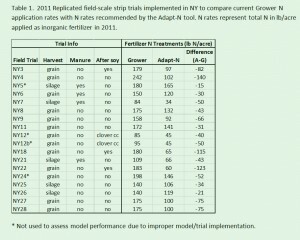 Errors were made in model and/or trial implementation in a few cases (labeled with * in Table 1): A clover cover crop was improperly simulated as an incorporated sod, resulting in a low Adapt-N recommendation and substantial yield losses. In other cases, Adapt-N fertilizer and manure inputs did not reflect real field applications, or N applications were made too late in the season. The lesson here is that correct input information is, of course, needed for Adapt-N to provide an accurate recommendation. The resulting yields and simulations from the above four trials were not representative of 2011 Adapt-N performance, and these trials were therefore removed from further analysis. 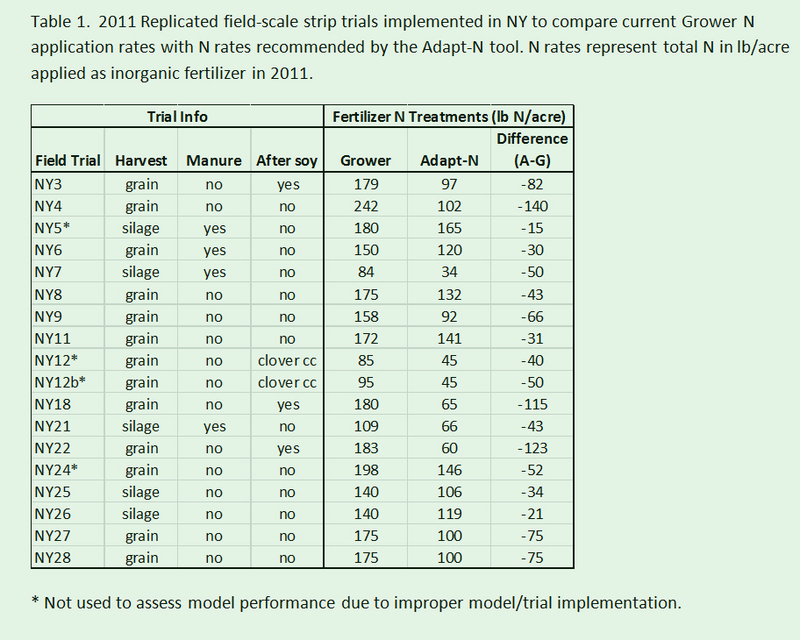 Agronomic, economic and environmental comparisons between Grower-N and Adapt-N treatments for each trial are provided in Figure 1, and as averages in Table 2. A comparison of grain and silage harvest data (Fig. 1a & 1b) shows that differences in yields were negligible and statistically not significant for almost every trial, despite substantially reduced N rates applied for the Adapt-N treatment (Tables 1 and 2). A case study describing one of these trials, conducted at Donald & Sons Farm, in Moravia, NY, where 140 lb of N were saved without yield loss, is described in a companion article in the current issue of What’s Cropping Up?. When the previous crop was soybean (3 trials), yield losses were found in every case (Fig. 1a), although the grower N rates were well above economic optimum N rates. We determined that Adapt-N overestimated the soybean N contribution, and thus provided low N recommendations in these three cases. The 2011 version of Adapt-N used a flat 30 lb soybean N credit, but also simulated immobilization of N in stover in corn-after-corn rotations, effectively almost doubling the N credit for corn following soybean. We believe that part or all of the soybean ‘N credit’ should mostly be regarded as an absence of an immobilization penalty for corn-corn rotations. Changes will be made to the Adapt-N tool to reflect these findings for the 2012 growing season. Estimated leaching losses (Fig. 1c & d), as well as total N losses (Table 2) decreased as a result of reduced N application rates for the Adapt-N treatment. 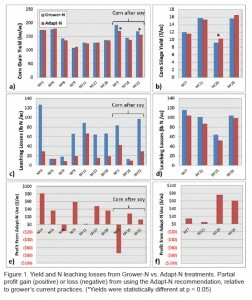 On average, leaching losses decreased by 38 lb N/ac in grain trials, and by 11lb/ac in silage trials. There was less room for improvement in silage trials because lower fertilizer rates were used after manure applications. 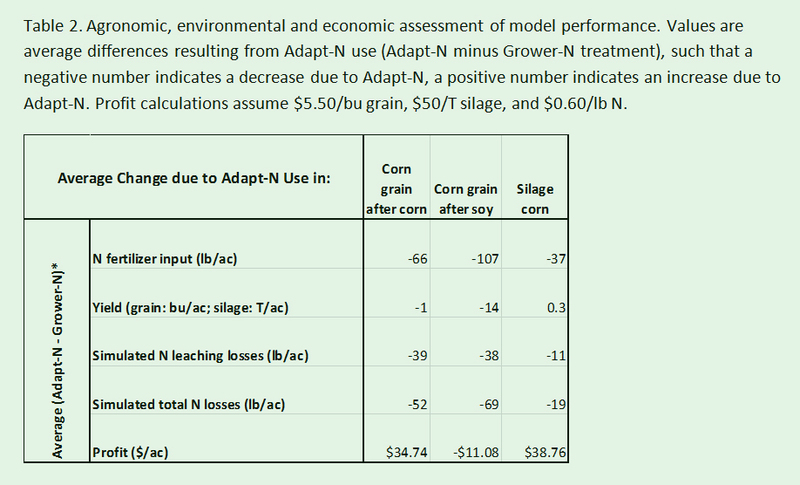 Most trials resulted in profit gains from the use of Adapt-N, ranging from $1 – $80/acre, (Fig. 1e & f). Average profit gains were $35/acre for corn after corn and $39/acre for silage corn (Table 2). Corn after soybean trials registered an average loss of $11/acre due to one trial with high yield loss (NY3). This was the only trial out of 14 (7%) where profit loss was significant. Fig. 2 indicates the low risk of profit loss (<14% overall before the correction of the soybean N credit), and high probability of improved profits (86%) of using Adapt-N in 2011. Our data suggest that after minor adjustments of the Adapt-N tool, it will be even better equipped to give accurate recommendations. Growers who tend to use high amounts of nitrogen will realize large savings. In a much wetter year, increased profitability would come from appropriately applying more N at sidedress time in order to prevent yield reductions from N losses. In the long term we expect that environmental losses will decrease in both dry and wet years, because this tool provides strong incentives to shift N applications to sidedress time. • N application rates were significantly reduced (15 to 140 lb/acre). • Grower profits increased on average by $35/acre, except in corn after soybean (due to model inaccuracies that are being corrected for the 2012 growing season). • N losses to the environment were decreased substantially (5 to 120 lb/acre). Adjustments to the Adapt-N tool will improve ease of use and accuracy for the 2012 growing season. The Adapt-N tool and information about it is accessible to stakeholders through any device with internet access (desktop, laptop, smartphone, and tablet) at http://adapt-n.cals.cornell.edu/, where information on account setup is also available. This work was supported by grants from the NY Farm Viability Institute and the USDA-NRCS Conservation Innovation Program. We are grateful for the cooperation in field activities from Bob Schindelbeck, Keith Severson, Kevin Ganoe, Sandra Menasha, and Anita Deming of Cornell Cooperative Extension, from Dave DeGolyer, Dave Shearing and Jason Post at the Western NY Crop Management Association, and from Eric Bever and Mike Contessa at Champlain Valley Agronomics. We also are thankful for the cooperation of the many farmers who implemented these trials. van Es, H.M., B.D. Kay, J.J. Melkonian, and J.M. Sogbedji. 2007. Nitrogen Management Under Maize in Humid Regions: Case for a Dynamic Approach. In: T. Bruulsema (ed.) Managing Crop Nutrition for Weather. Intern. Plant Nutrition Institute Publ. pp. 6-13. http://adapt-n.cals.cornell.edu/pubs/pdfs/vanEs_2007_Managing N for Weather_Ch2.pdf. [URL verified 2/22/12]. EPA, 2010. Inventory of U.S. Greenhouse Gas Emissions and Sinks (1990-2008). U.S. Environmental Protection Agency, Washington, DC. Growers across the country have used a wide range of methods to decide on nitrogen (N) application rates for corn, from mass balances to a variety of soil and plant tissue tests, to maximum return to nitrogen curves, to… simply… rules of thumb. But most are frustrated by the lack of accuracy of these methods. Early-season weather can greatly impact how much N fertilizer is needed year to year, and this variability has been difficult to manage. The amount of N fertilizer required could easily differ by 100 lbs from one year to the next. This variability results in average N recommendations that are higher than needed in many years, leading to profit loss for growers and environmental damage through N losses to water as nitrate and to the air as nitrous oxide, a potent greenhouse gas. The web-based Adapt-N tool has the potential to change the way N management is done. 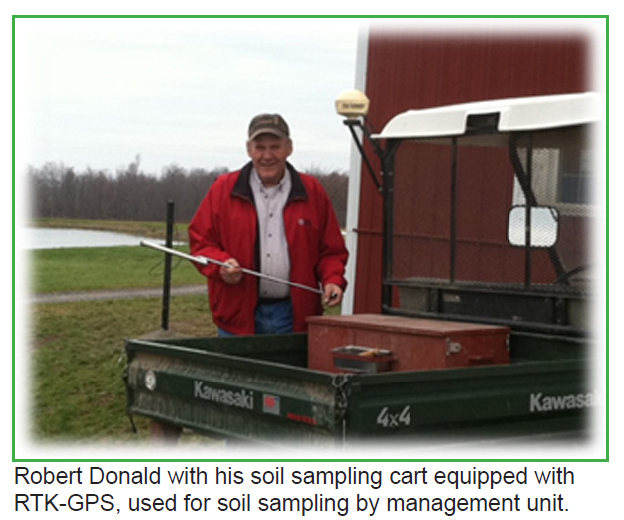 Soil data, along with crop and soil management information are supplied by the grower. The Adapt-N tool uses these data in combination with newly available high-resolution climate data to simulate N availability and losses due to weather, and thus provide more accurate sidedress N recommendations. The tool is undergoing beta-testing in on-farm strip trials across New York and Iowa in the 2011 and 2012 growing seasons. Once fully validated, Adapt-N will, over the long term, help reduce N losses to the environment that contribute to air and water pollution, while saving farmers money through the optimization of fertilizer purchases and application rates. One of the New York agricultural enterprises collaborating with the Adapt-N team is Donald and Sons Farm located in Moravia, NY. The farm has been in the family for several generations and currently encompasses 1500 acres of land. In 2011, 1050 acres were in corn and 250 in soybeans. The Donald brothers, Robert and Rodney, are no strangers to on-farm research and have collaborated with Cornell University and private companies many times over the years. When asked why they keep getting involved in research Rodney replied, “Money! Some [projects] take you down a dead end street, but if we see, for example, that we can save putting 100 lbs [of N] on, that’s a lot of money.” So, although the on-farm research can be time consuming for Robert and Rodney, they see the value in the important benefits it can generate. This past spring, Robert and Rodney identified 10 acres of a 100-acre field to implement a replicated strip trial to test the Adapt-N tool. The field was planted with corn on May 21st with 22lbs of N from monoammonium phosphate starter. 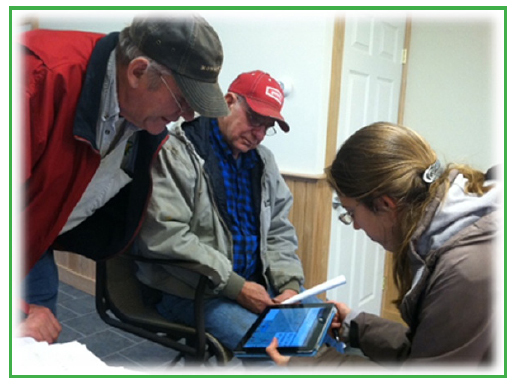 In early June, Keith Severson of Cayuga Cooperative Extension used Adapt-N, inputting the Donald brothers’ field information, such as organic matter content, expected yield, tillage, fertilizer inputs, etc., to generate an N sidedress recommendation of 80 lb N/acre. However, as the season came to a close the results indicated otherwise. There was no loss in yield despite the 140 lb application rate difference. The Donald’s yield monitor data showed spot-yields between about 120 and 230 bu/ac. The average yields for the conventional plots were 174.1 bu/ac, while Adapt-N average yield was 173.6 bu/ac. Robert and Rodney were shocked by the results stating, “it wasn’t until we were combining that we realized the yield wasn’t really different even though there was a 140 lb N difference [in sidedress rate]”. The results show great promise for the Adapt-N tool and for the Donald brothers’ ability to save on N fertilizer. Assuming that the trial field was fairly representative of the rest of the farm, the Donalds would have saved approximately $70,000 in fertilizer in 2011. A post-season Adapt-N simulation estimated that they had also reduced their N leaching losses in 2011 by about 77%, from 142 to 32 lbs/ac. Robert and Rodney intend to collaborate on more extensive testing of the Adapt-N tool next year and see whether different weather conditions affect the recommendations. In addition to another fully replicated strip trial, they may use variable-rate recommendations provided by Adapt-N in strips next to those provided by A&L Laboratories on multiple fields. When discussing variable rate application with the brothers, using rates with drastically higher N amounts than needed by the crop was likened to “aiming for the bull’s eye in the opposite direction of the target,” to which Rodney laughingly replied, “I’ve been doing that all my life.” Variable rate application using Adapt-N should allow for a more accurate AND precise accounting of the effects of organic matter-derived N and texture in interaction with that year’s weather on overall N availability. Overall the trial suggests that more accurate N recommendations based on weather impacts, in addition to soil and management information, could lead to substantially higher profits for farmers, while reducing environmental losses in most years. This creates a win-win situation as farmers face higher costs for fertilizer and we search for feasible and effective ways to reduce detrimental losses to the environment. 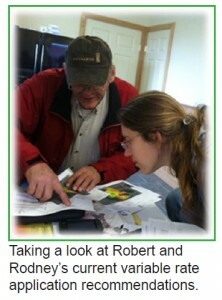 This work was supported by grants from the NY Farm Viability Institute and the USDA-NRCS. Thank you to Robert and Rodney Donald for their cooperation in diligently implementing this trial, and taking the time to share their thoughts. For more information about the Adapt-N tool, visit http://adapt-n.cals.cornell.edu/. Soybean acreage continues to expand in New York with many first-time growers now planting the crop. Many new growers plant soybeans with a corn planter instead of a grain drill, which has been the almost exclusive planter for soybeans in NY over the last 30 years. Also, some experienced soybean growers, who no longer plant wheat, have switched to a corn planter to save on equipment costs. In addition, some growers are purchasing new row crop planters with inter-units allowing for corn planting in 30-inch rows and soybean planting in 15-inch rows. With that in mind, we conducted field-scale row spacing by seeding rate studies in 2010 and 2011 on farms in Cayuga and Livingston Counties to evaluate soybeans planted with a drill in 7.5 inch rows vs. planting with a row crop planter in 30-inch or 15-inch rows. The Cayuga County farm was a no-till site and the Livingston County farm was a chisel tillage site. The growers performed all management practices and we took numerous measurements, of which early stand counts and yield (with a Weigh Wagon) will be presented here. Early stand establishment at Cayuga Co. averaged about 72% (107,287 plants/150,000 average seeding rate) for the drilled soybeans in 7.5 inch rows (Table 1). In contrast, early stand establishment averaged about 83% in 30-inch rows at Cayuga Co. Likewise, drilled soybean in 7.5 inch rows had much lower stand establishment at the Livingston Co. site. Drilled soybeans in 7.5 inch rows averaged 69% early stand establishment (103,645/150,000) compared to about 81% in 30 inch rows at the chisel tillage site. Apparently, under actual grower practices, stand establishment is much better in 30-inch rows when planted with a corn planter compared with drilled beans in 7.5 inch rows. Poorer stand establishment for drilled beans may partially explain the yield data from these field-scale studies. Previous small-plot research at the Aurora Research Farm in the mid-1990s and in the late 2000s indicated that drilled beans yielded anywhere from 7 to 15% greater than 30-inch beans planted with a corn planter. In these field-scale studies, however, row spacing did not affect soybeans at the no-till Aurora site. At the chisel tillage site, drilled beans yielded only about 4% greater than beans in 30-inch rows, if planted at 170,000 seeds/acre (Table 1). Some wheel traffic damage from post-emergence pesticide applications may also have damaged the drilled soybeans more than the 30-inch soybeans, which could have reduced any yield advantage for drilled or narrow row soybean. Row spacing had much less of an impact on soybean yield than expected in these field-scale studies. At a no-till site, row spacing did not affect yield. At a chisel tillage site, drilled soybean planted at 170,000 seeds/acre yielded about 4% more than 30-inch soybean at 130,000 seeds/acre. Apparently, growers can plant soybeans in 30-inch rows without much of a yield loss, especially in years or fields where yields are in the 50-65 bushel/acre range. At sites or in years where growth is slow and yields are low, the yield advantage for drilled soybeans may be greater than reported in this study. Comments Off on Planting Soybeans….Should I Buy a Grain Drill? Planting Soybeans….Should I Buy a Grain Drill? Soybean acreage has more than doubled in NY over the last decade. In 2000, NY growers planted about 135,000 acres of soybeans, but planted about 280,000 acres in both 2010 and 2011. More importantly, total annual value of soybeans has averaged about $145 million over the last 2 years, almost 40% of the value of all commercial vegetable crops in NY, indicating that soybeans are no longer a minor crop. Increased acreage comes from a combination of long-time growers planting more acres and new growers adding soybeans to their rotation. Some new growers are from regions in NY where wheat is not in the rotation. Consequently, these new growers, who do not own a grain drill, are seeding soybeans with a standard row crop planter (30 inch rows). An obvious question is should these new growers purchase a grain drill or continue to seed soybeans with a corn planter in 30-inch rows? We conducted field scale studies in 2010 and 2011 on cooperator farms in Central (Cayuga County) and Western New York (Livingston County) in order to investigate the effect of row spacing on soybean yield using actual grower management practices. The cooperating farmers performed all field operations including tillage, planting, chemical application and harvest. We used a Weigh Wagon to record yield and also took other measurements including stand counts, weed counts, lodging, plant height, disease incidence, and moisture at harvest. The Cayuga Co. farm was planted no-till in both years while the Livingston Co. farm was chisel plowed in both 2010 and 2011. Economic analysis was conducted for costs associated with purchasing a grain drill appropriate for planting 300 acres (15 ft. drill-list price $20,000), 600 acres (20 ft. drill-list price $25,500) and 1200 acres (30 ft. drill-list price $46,000) of soybeans. The results are reported in real 2012 dollars, based on the average soybean price of $11.50/ bushel and seed cost of $52/ bag (150,000 seeds) in 2010 and 2011. As reported in the previous article, there were no differences in yield among the three row spacing’s. Consequently the grower at this location, who practices a corn-soybean-wheat rotation, can use either a no-till grain drill or row crop planter to plant soybean into high-residue corn conditions. If the grower switches to an exclusive corn-soybean rotation, the grower can continue to use the grain drill but not purchase a new drill once it requires replacement. Instead, the grower should only maintain a row crop planter without inter-units and plant corn and soybean in 30-inch rows. At this location we did see differences in yield. The drilled (7.5 in) soybeans at the recommended seeding rate of 170,000 seeds/acre showed a 2.4 bushel/acre or about a 4% yield advantage compared to 30-inch rows at a seeding rate of 130,000 seeds/acre (64.1 vs. 61.7 bushels/acre). For this farm that already owns a grain drill, the relative profit of drilling soybeans in 7.5 inch rows at the higher seeding rate compared to planting in 30 inch rows at the lower seeding rate would be a function of the market price received for the harvested soybean crop minus the seed cost associated with the higher seeding rate. So, if the grower paid an average price of $55/bag for seed and marketed the crop at $11.50/bushel in the 2010 and 2011 growing seasons, the farmer at this site would have realized an increase in net farm profitability of about $13.30/acre by planting with a grain drill (Table 1). 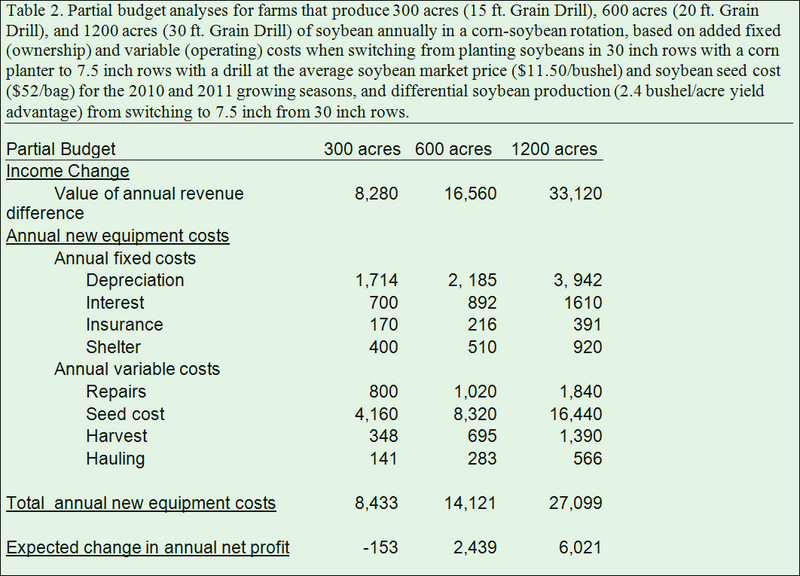 If seed costs increase and prices received for the crop decrease in the future, profit will shrink (Table 1). For farms that do not own a grain drill, should they purchase one if there is a 2.4 bushel/acre yield advantage? We considered the annual fixed costs of owning a grain drill, including depreciation, interest, shelter and insurance. Likewise, we considered the annual variable costs of ownership, including repair costs, harvest and hauling costs and the cost of the extra seed (40,000/150,000 x $52/bag =$13.87/acre) needed to drill soybeans at 170,000 seeds/acre compared with 130,000 seeds/acre when planted with a corn planter. 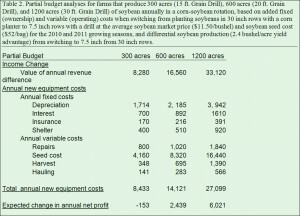 The breakeven point for purchasing a grain drill to seed soybeans based on prices and costs in 2010 and 2011 and a 2.4 bushel/acre yield advantage is around 300 acres. The grower would realize an increase in net farm profitability by purchasing a grain drill if planting 600 or 1200 acres of soybeans (Table 2). As expected the more soybean acres planted, the greater the increase in net farm profitability. Our economic analyses indicate, given 2010 and 2011 seed costs and market prices and a 2.4 bushel/acre yield advantage for drilled beans, growers who own a grain drill would have reaped a profit of about $13-14/acre if seeding soybeans with a grain drill. For growers who don’t own a grain drill, buying a grain drill would be profitable at 2010 and 2011 prices, if planting more than 300 acres of soybeans. On farms with less soybean acreage or no yield advantage, buying a grain drill does not provide an economic advantage. The net farm profitability, however, will vary significantly when the yield advantage for drilled soybeans, the price of soybean seed, and the price received by the farmer for their crop vary. Two thistles common to New York State are bull thistle (Cirsium vulgare) and Canada thistle (Cirsium arvense). Both were introduced from Eurasia and became naturalized in Canada and the United States. Although closely related and somewhat similar in appearance, theses thistles exhibit some differences in form and have very different life cycles. These life cycle differences play an important role in timing of control measures. Bull thistle is a biennial weed that reproduces by seed only. All biennials require two growing seasons to complete their life cycle. 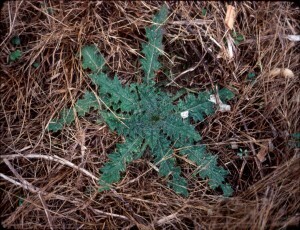 In the first year, bull thistle germinates from seed and forms a rosette or basal cluster of leaves (see photo) with a large fleshy taproot. After overwintering in this stage, the plants complete their life cycle by forming a flowering stalk and setting seed during the second growing season. The stems of bull thistle may be 3 to 6 feet tall, are often branched, and are more or less hairy. The leaves are deeply cut, spiny, and run down the stem (Figure 1). Deep purple or rose flower heads are formed during the second growing season. These heads are 1 to 2 inches in diameter and are surrounded by numerous spiny tipped bracts. 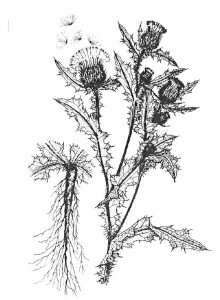 Bull thistle is found in pastures, meadows, and waste areas. Although it is an aggressive weed in these situations, it does not survive in tilled fields. 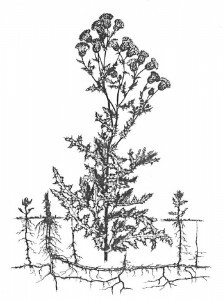 feet deep, some distance horizontally (Figure 2), and allow individual plants to live for more than two years. Canada thistle stems are grooved and are 2 to 5 feet tall with branching only at the top. The stems are somewhat hairy when mature. The leaves are smooth, somewhat lobed, and usually have crinkled edges and spiny margins (see photo). The flower heads are numerous, compact, and are borne in clusters. The lavender heads are ¾ inch or less in diameter. Male and female flowers are usually in separate heads and on different plants. As a result, some patches of this weed never produce seed. Canada thistle is found throughout the northern half of the United States. 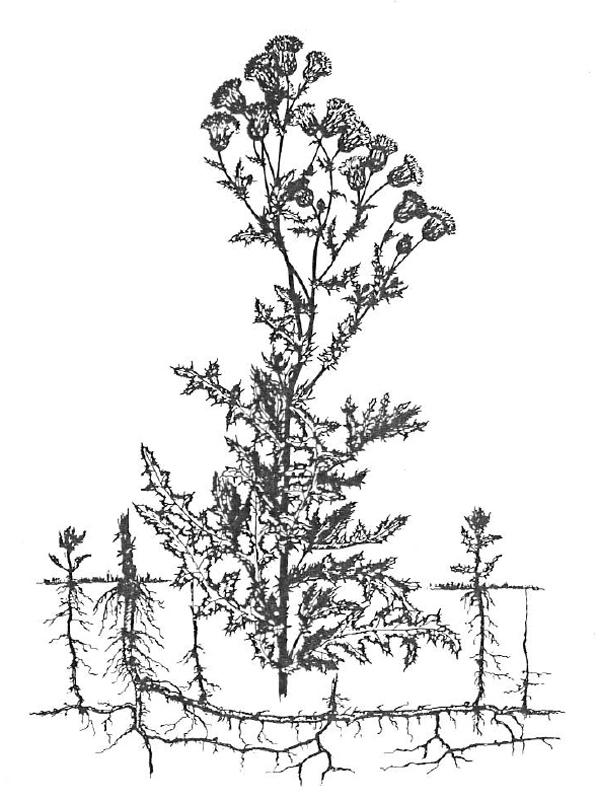 Like bull thistle, it can be problematic in pastures, meadows, and waste areas. In addition, its’ perennial nature allows it to thrive in cropland as well. Both of these thistles are somewhat sensitive to growth regulator herbicides (synthetic auxin/Group 4 herbicides) such as 2,4-D and Banvel/Clarity. These readily translocated herbicides are recommended for control or suppression of both species in grass pastures, however application rates and timing differ. 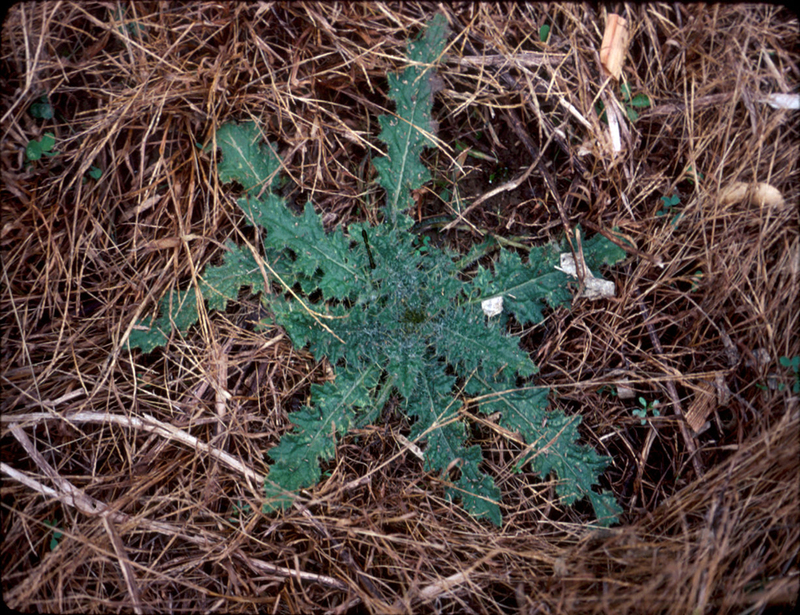 For bull thistle control, application of 3 pt/A of 2,4-D (3.8 lb/gal formulation) or 1 pt/A of Banvel or Clarity to the rosette stage in fall or early spring before the plants send up the flower stalk is recommended. 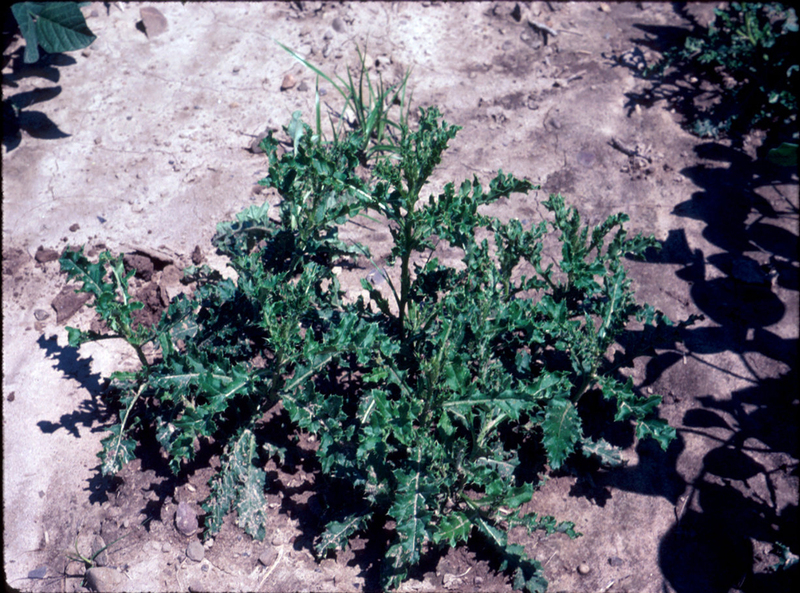 For Canada thistle, the ideal timing would be during periods of active growth after weeds have reached the bud stage in mid- to late summer, but before killing frost. At this time, the plants have maximum leaf area to absorb herbicides and begin moving carbohydrates into the rootstocks. These stored carbohydrates allow the plants to survive winter and emerge again in the spring. Herbicide movement into these rootstocks is facilitated by this process. Application of 4 pt/A of 2,4-D (3.8 lb/gal formulation) or of 2 pt/A of Banvel or Clarity are recommended for Canada thistle suppression in grass pastures. Repeated applications of these herbicides would likely be needed to bring this tough weed under control. With both 2,4-D and Banvel/Clarity, label instructions specify grazing and harvesting restrictions for pasture situations. Lactating dairy animals should not graze 2,4-D treated areas for 7 days following application and meat animals must be removed from 2,4-D treated areas for 3 days before slaughter if less than 14 days have elapsed since treatment. Lactating dairy animals should not graze for 7 days after treatment with up to 1 pt/A, and for 21 days after 2 pt/A of Banvel or Clarity. Meat animals should be removed from areas treated with Banvel or Clarity 30 days before slaughter. Applications made at the end of the grazing season in late summer or early fall can minimize concerns about these grazing restrictions.